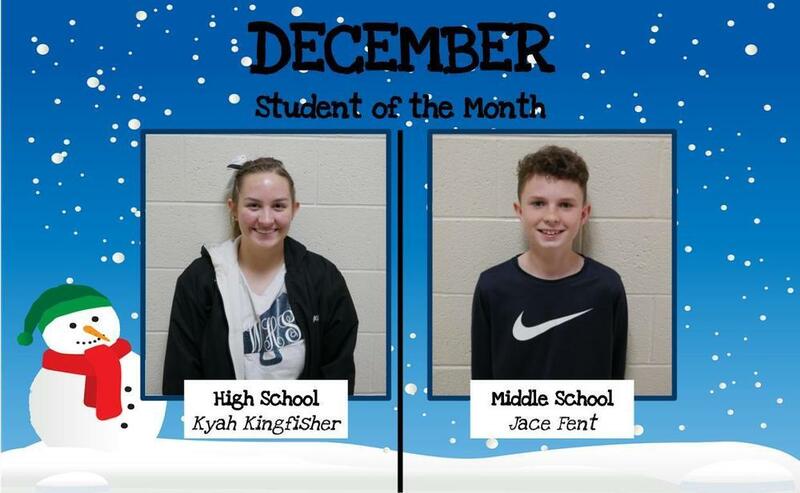 We are pleased to announce our December students of the month. For middle school, Jace Fent and high school, Kyah Kingfisher. Congratulations and great work! Jace Fent is in 6th grade. He is the son of Russell and Kelli Fent. He is actively involved in basketball, baseball, MS student council, 4H, and he shows pigs. Some of his favorites are the color orange, steak, athletics, and Mrs. Henderson. Kyah Kingfisher is in 12th grade. She is the daughter of Ronnie and Cyndi Kingfisher. She is actively involved in National Honor Society (President) and cheerleading. Kyah is also the senior class treasurer. Some of her favorites are the color pink, tomato soup, College US History, and Mrs. Hampton.